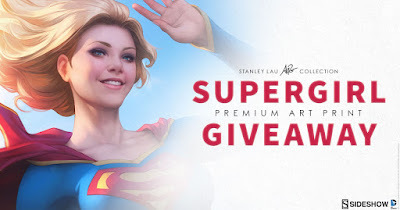 DC Comics and Artgerm fans will be very excited for Sideshow’s next contest! Enter today and you’ll be in the running for ONE (1) Framed Supergirl Premium Art Print that Sideshow is giving away! This 18×24″ hand-numbered, limited edition art print will feature an embossed seal of authenticity and authorized, automated penciled signature. The edition size will be set at 350, and will be available framed or unframed.